I was trying to set up my magento store to use the ssl certificate I just bought and was told to change the base url to https instead of http. Find table (core_config_data) from database. 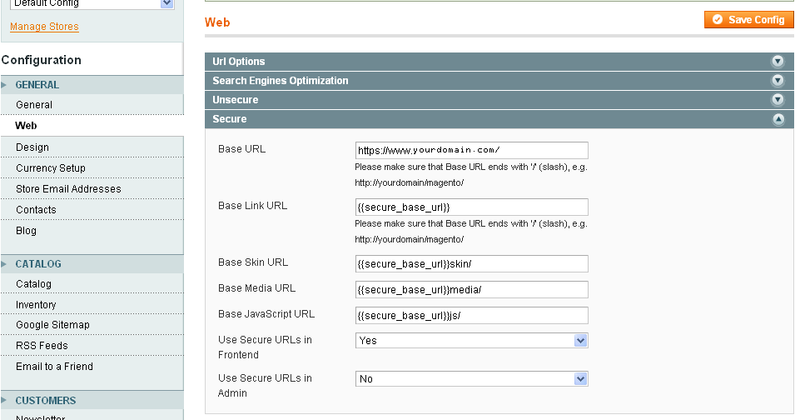 (web/unsecure/base_url) & set Url without https. (web/secure/base_url) & set Url with https. After that your website will work. Use Secure URLs in Frotnend set to "Yes"
Bellow screen shot example for it. if you can not access admin then you have to change base url directly from database. Not the answer you're looking for? Browse other questions tagged magento-1.9 404-page base-url or ask your own question. Where does Magento change HTTP to HTTPS in the HTML code?